At K 2013, BASF will showcase its Ultracom™ thermoplastic composites for the automotive industry. The second component of the Ultracom package are the overmoulding materials that have been developed for use with these laminates. These are compounds from the Ultramid and Ultradur range. 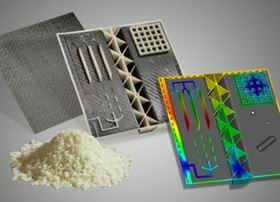 BASF says that by using them in combination with the laminates and tapes, it is possible to injection mould complex parts with very high mechanical reinforcement (using continuous fibres at precisely defined locations) while simultaneously incorporating specific functions as the result of overmoulding. for crash loaded applications with a need for impact strength, Ultralaminate and Ultramid ZG7 COM. The first pre-production Ultracom parts will be displayed at K 2013. The third component of the Ultracom package is engineering support, based on BASF's Ultrasim® simulation tool. Working with customers in the automotive sector, BASF wants to develop production concepts for thermoplastic composites with continuous fibre reinforcement for body and chassis parts in 3 years. BASF intends to spend a "high two-digit million euro sum" on composites R&D in the next 3 years. Some customer projects have already started.